Linda Shenton Matchett: B-29: The Ultimate Bomber? Wartime Wednesday: B-29: The Ultimate Bomber? 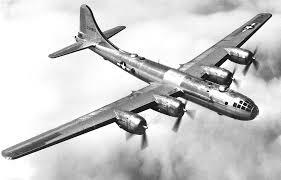 Retired now, the Boeing B-29 Superfortress was a four-engine propeller-driven heavy bomber flown primarily by the United States during World War II and the Korean War. The Boeing website indicates the plane was one of the largest aircraft operational during World War II and very advanced for its time. 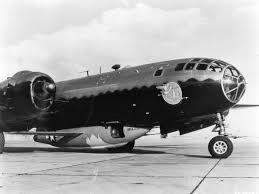 Its guns could be fired by remote control, and two crew areas, fore and aft, were pressurized and connected by a long tube over the bomb bays, allowing crew members to crawl between them. The tail gunner had a separate pressurized area that could only be entered or left at altitudes that did not require pressurization. The Boeing site also reports that the earliest B-29s were built before testing was finished, so the Army established modification centers where last-minute changes could be made without slowing expanding assembly lines. 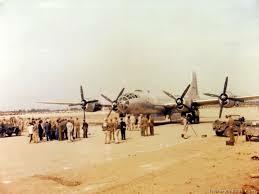 Those associated with the B-29s were well aware of the lack of testing conducted on the planes. It is these kind of stories and impressions that are often missing from official reports, and why projects that capture the memories of “The Greatest Generation” are so important.